- Our products will be shipped through trusted shipping services such as, USPS, UPS, FedEx, LaserShip, ParcelPool and Prestrige. It’s our sole discretion on which service to use for your shipment. - We only ship to the lower 48 states only, with no APO/FPO addresses or PO Boxes allowed. Local pickups and combined shipping options are not provided at this time. - We usually ship within 1-2 business days after receiving cleared payment via PayPal only, and it would take 1-6 business days for the shipment to arrive at your destination. - Return shipping costs are covered by the buyers unless the item arrived as not as described or damaged. Returns for the reasons such as mistaken order, unwanted item or buyer’s remorse may be subject to restocking fee at our discretion. - Please kindly not leave a neutral or negative feedbacks until you have contacted us. We are always ready to attend to your problems and make things right for you. In any case, please kindly contact us if you have any concerns. If you would like to return your purchased merchandised, please kindly contact us via eBay message by choosing “I have a question about using my item or I want to send the seller a message.” as the topic. We will provide you with the return shipping label with the tracking number to your PayPal email address and the return address confirmation to your eBay message. The location of the warehouse responsible for the return will be determined by the fulfillment service department. Once the item has been delivered, we will issue you the refund for the purchase. You have 30 days grace period after the delivery of the item to complete the return. We will be responsible for return shipping costs (if any) if the merchandise received is either not as described or damaged in any ways. As for returns due to any other reasons, such as change of mind, mistaken purchases, or buyer’s remorse, you will be responsible for the round trip shipping costs. Restocking fees may also apply at our discretion. Please be informed that our products are being stored and fulfilled by third party warehouses and manufacturers throughout the United States (also known as third party fulfillment or product sourcing). Therefore, the most appropriate return location will be determined by the respective warehouses or manufacturers, depending on your location and product types. Please note that the return shipping location may differ from the return address stored on eBay. Please refer to the return instructions and follow them accordingly to ensure successful return processes. The DuroMax XP4850EH unit features a 7 Horsepower, Air Cooled Engine and is designed with a Low-Oil Shutoff Sensor to protect the Motor. It offers the switching capability of running on Propane or Gasoline fuels. Built to offer more power and longer lasting durability, The DuroMax XP4850EH Generator has a Cast-Ironed Sleeved, 196cc engine rated at 7 HP delivering a peak of 4,400 surge watts / 3,500 Constant. 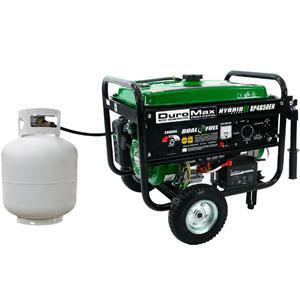 This is a sufficient amount of power that can handle an overhead Air Conditioner in a RV to basic house power. Designed for Safe and Easy Operation, the XP4850EH features a user-friendly, Electric Start, that's as simple as starting your car. It is also equipped with a recoil start in case of the battery being drained. Solid-Fill tires are also standard, they will never run flat, and high leverage handles that make it easy to transport over every terrain. The attached over-sized noise reducing Muffler has a built-in Spark Arrestor for safe use in mandated camping areas and job sites. Simply remove all packaging, assemble the wheels & handles, add Oil and Gas and it is ready to begin producing power. 3 Year DuroMax Factory Warranty. Powerful DuroMax 7 HP Engine is able to accept high wattage loads with ease. Dual Fuel Capability Allows for 20 Hours on Propane or 8 Hours on Gasoline. Oversized Muffler reduces engine noise allowing for quieter operation than other models.